FAILURE IS IMPOSSIBLE WHEN YOU FOLLOW THESE SIMPLE MAGICKAL INSTRUCTIONS, CLAIM THE AUTHORS! Here are the magickal formulae of two important traditions, one from the East, that of the Magi of the Persians, the other from the ancient northern European culture based on the runes. Both traditions derive ultimately from the same common source in the Middle East. Authors W.A. 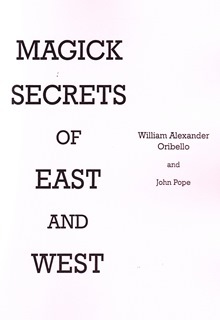 Oribello & J. Pope are initiated into both traditions, receiving secret information for Adepts only. Now, their sources have permitted publication of these secrets. Revealed is the SUPREME MYSTERY WORD OF POWER of the Magi – three of whom were the ‘wise men’ present at Christ’s nativity a word which can give you mastery of your circumstances. Also here is the magi secret numbers’ code, made easy to understand and follow. The reader is advised to meditate on these numbers before entering a lottery! These words and formulae can bring you riches … radiant health … true love … luck without end … happiness … protection from harms. Discover the supreme runic word which effectively means ‘everything in the gods’ universe’: speaking it allows the blessings of the Cosmos to enter your life! The word ‘magick’ is derived from the Magi, the fire-cult priests of Persian Zoriastrianism. It doesn’t matter how much you have failed before – with these ancient words and rites everything is about to change. 36 Techniques Which Unveil Cosmic Mysteries.